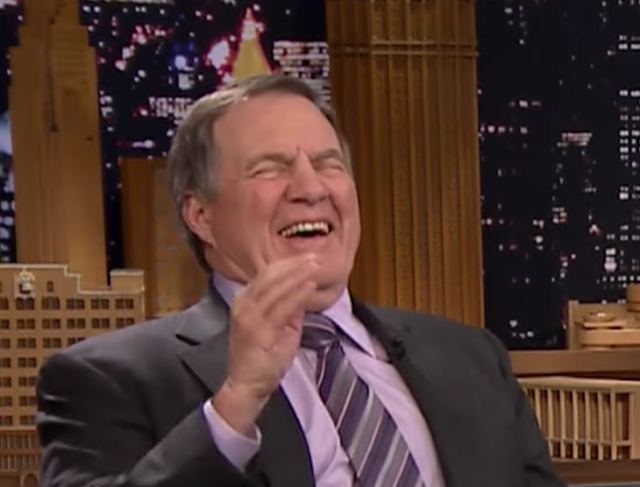 Bill Belichick doesn't seem to smile much, let alone laugh. However after such a phenomenal Super Bowl LI victory and his fifth Championship Ring, the Patriots' Head Coach let down his guard on Jimmy Fallon's Tonight Show. This moment shows an excellent example of Sincere Laughter (5:35). Moreover Belichick's laughter is also quite deep. Sincere laughter may have a forehead which is relaxed or contracted - but during sincere smiling the forehead is ALWAYS relaxed. True Laughter may show both upper and/or lower teeth, while sincere smiling ONLY displays upper teeth (with the exceptions of smiling crescendoing to, or decrescendoing from sincere laughter - or with a high camera/visual angle and/or with a tilting down of the head). Sincere smiling ALWAYS has eye lids which partially or nearly entirely closed. This is also ALWAYS accompanied by a dynamic, concave-up furrow in the lower eyelids. 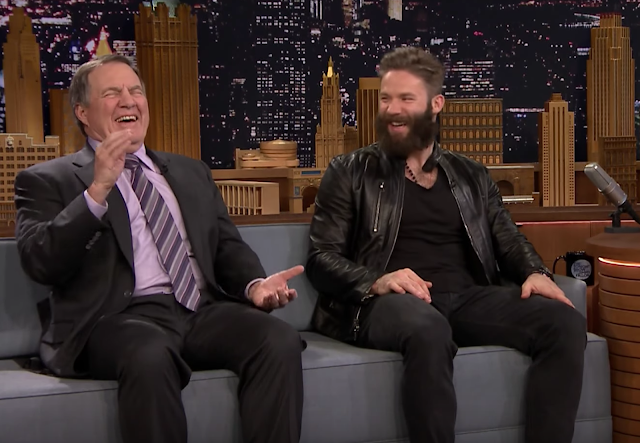 This is well exemplified on both Bill Belichick and Julian Edelman. During sincere laughter which is both sincere and deep, the eye lids virtually always close - often very tightly. Congratulations to the New England Patriots for what many will say was the most exciting football game they've ever seen.